Greetings again from the darkness. Poop. Poo, doodie, s**t, feces, excrement, doo-doo, dung, dookie, defecate, bowel movement, and number 2. Director Aaron Feldman threatens to waste (pun) our time by opening on comedians dumping (another one) their various forms of scatological humor. Instead he leaves us a special surprise (!) by creating some kind of docu-comedy on poop that also serves as a bit of an awkward sociological case study. The surprise here is that the comedians from the opening never stop. They ARE the movie. 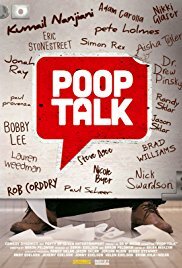 It’s actually 75 minutes of comedians riffing on poop. They tell us their jokes, but more interestingly, they tell us the motivations for this line of humor. Indelicacies and embarrassment are what drives comedy, and I counted 39 different folks providing some insight here. Rather than a rant, it’s more of a case study on the realities of why we draw such a hard line between our public persona and the regular (hopefully) occurrence in the privacy (also hopefully) of a bathroom/toilet. Even that last part isn’t a given, as the process in other countries like Korea and India is detailed. The Sklar brothers are Executive Producers and also provide some terrific on screen segments, but the list is too long to name all of the participants – most of whom you will recognize. I’ve seen some documentaries that might best be labeled as turds, but never one who focuses on that topic. Why is it taboo? Are there differences in how men and women tend to treat this (definitely yes)? The laughs are aplenty and its flush (the last one) with insight from comedians. That’s enough reason to sit through this one … and you won’t even need a magazine! This entry was posted on Friday, February 16th, 2018 at 6:54 pm and is filed under Documentary. You can follow any responses to this entry through the RSS 2.0 feed. You can leave a response, or trackback from your own site.